Big Political Donors Shy Away From Public Scrutiny Some donors willing to write seven-figure checks to superPACs have gotten something they weren't counting on: attention from the political opposition and the media. One donor says he feels like he has a "target strapped on my back." Charles Koch of Koch Industries speaks in 2007 about his book The Science of Success in Wichita, Kan. Yet it seems there's something wealthy donors weren't counting on when they wrote those checks — attracting attention, including from the political opposition and the media. "There's been a ton of so-called electronic media journalists that have lodged all kinds of innuendo in my direction, accused me of all kinds of bad things," says Frank VanderSloot, who wrote checks totaling $1 million to Restore Our Future, the superPAC supporting GOP presidential candidate Mitt Romney. Any superPAC donor who gives more than $200 has to be reported to the Federal Election Commission, and that information is released to the public. That's how journalists found out about VanderSloot's donation and began looking into him. That's how President Obama's campaign got VanderSloot's name, too. On a website called Keeping GOP Honest, the Obama campaign posted a list of big donors to the pro-Romney superPAC, including VanderSloot. VanderSloot told Fox News he was taken by surprise: "That really worried me at first, I'll tell you, and my first anticipation was that, 'Yeah, I've got a target strapped on my back.' And sure enough, then the attacks started coming, and I really thought I'd made a mistake." He says he's gotten negative press, received unsavory emails and lost customers. Charles and David Koch say they've been targets of attacks, too. The brothers are high-dollar contributors to conservative nonprofit groups, also running ads in the presidential race. But because their donations are going to so-called social welfare organizations, the contributions remain secret. Koch Industries' general counsel, Mark Holden, talked to MSNBC's Martin Bashir in May about the brothers' involvement with a group that supported "stand your ground" laws like the one much discussed after the fatal shooting of Florida teen Trayvon Martin. 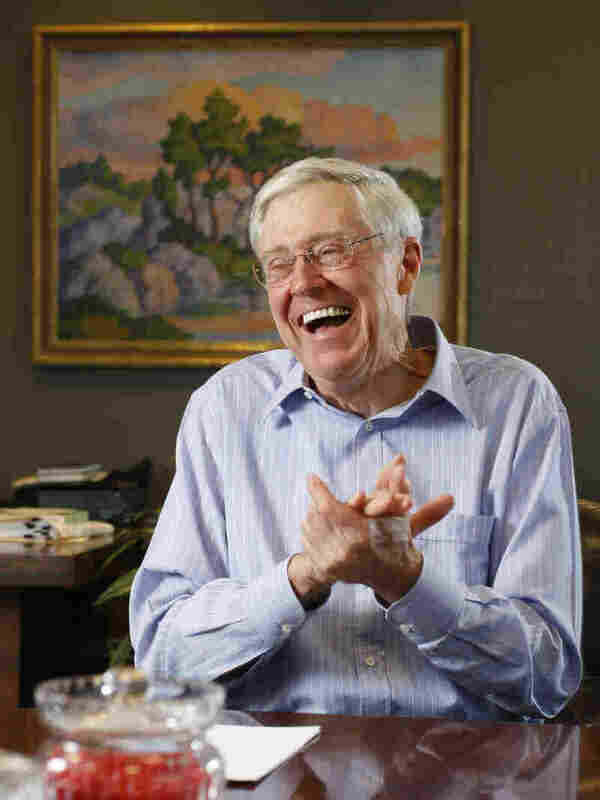 After Bashir asked Holden a series of questions about the brothers' political contributions, Holden said the media is irresponsible in its reporting on the Kochs. "The way that [MSNBC] has handled issues with us, the way that a lot in the far left media have handled issues with us, attacking us even when there's no basis, like with the Trayvon Martin issues — that situation, that has led to death threats against our owners," Holden said. "Charles and David Koch have received phone death threats, they've received email death threats, Internet death threats — this is where this leads. It's irresponsible." 'Intimidation' Or 'The Price Of Democracy'? The top Republican in the U.S. Senate, Mitch McConnell of Kentucky, says the problem has gotten so bad, it's infringing on these donors' right to free speech. "This is nothing less than an effort by the government itself to expose its critics to harassment and intimidation," McConnell said at the American Enterprise Institute, a conservative think tank. In his speech, he said if donors are giving to independent superPACs or to those social welfare groups, they shouldn't be forced into the public eye by campaign disclosure laws. "That's why it's critically important," McConnell said, "for all conservatives, and indeed all Americans, to stand up and unite in defense of the freedom to organize around the causes we believe in." To which Norm Ornstein of the American Enterprise Institute responds: "The fact that you get negative press coverage because you have decided to get involved in politics is, as Justice Scalia said, a part of the price of democracy and getting involved." Ornstein says those donors had to have known their names would be public, and they chose to contribute. The fact that they don't want to talk about it now, he says, doesn't make much sense. NPR has contacted many wealthy contributors for its "Million Dollar Donors" series. Not one of them would speak on tape. For this story, NPR again attempted to contact those donors to ask why they declined the first interviews but did not receive a response. Ornstein says there's a reason journalists and the political opposition are paying attention to these big donors: Voters want to know about them. "If you're judging candidates and making your vote choices based on what you hear, you have got to be able to know who is saying the things that you hear," Ornstein says. In other words, voters want to know who is trying to influence the election and toward which candidate. And, says Ornstein, writing big checks to groups running political ads is, by definition, trying to influence the election.